Oh Kenny, you’re unwavering desire to work less hours than you actually do is still surprising, even to me. Tune in for the next installment where we see how badly the DBM gets burned for Kenny’s slacking off. 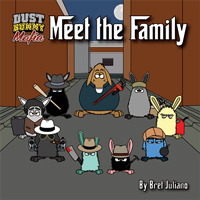 If you sign up for the Dust Bunny Mafia monthly newsletter. I’ll send you a DBM sticker at no cost to you. You can sign up for the newsletter here: DBM Monthly Newsletter Sign-up. Kenny the Crypt: "Ok, we’ve got an appointment tomorrow night for the bug sweep." Leo the Boss: "Why tomorrow night?" Kenny the Crypt: "Dunno, that’s all they had available on short notice." Leo the Boss: "Well, looks like we’ll be staying late then won’t we?" Kenny the Crypt: "So, does that mean I can start later tomorrow?" Leo the Boss: "HA! In your dreams Kenny, in your dreams..."
Well, at leazt what he zaid make zenze. Sense? Yes, but he lacks any bit of a work ethic to warrant those privileges.